…so long as them show is going on! Such are the Northern Lights! 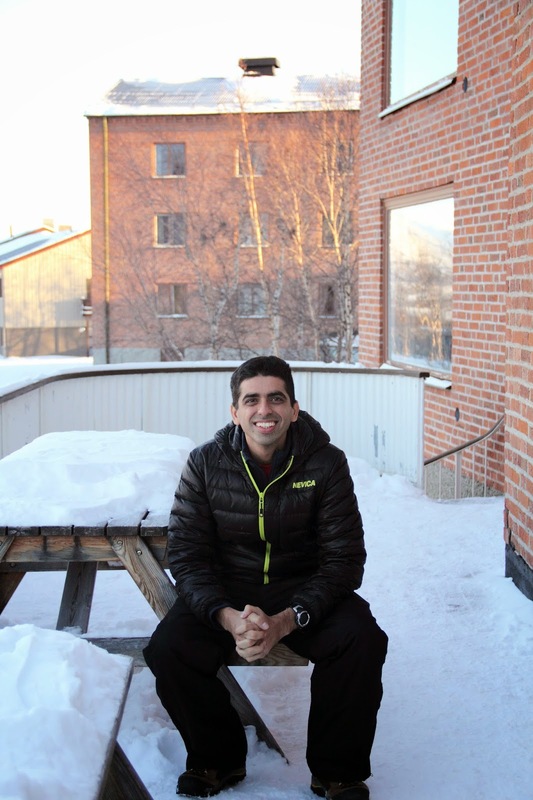 Ankur had been wanting to see the Northern Lights for the past few years. The plan never materialized as getting to the arctic from the tropics costs a fortune. But when we read that 2013 and 2014 were the best years (in an eleven year cycle) to witness the aurora borealis in its glory, we knew that it was time to head to the arctic. 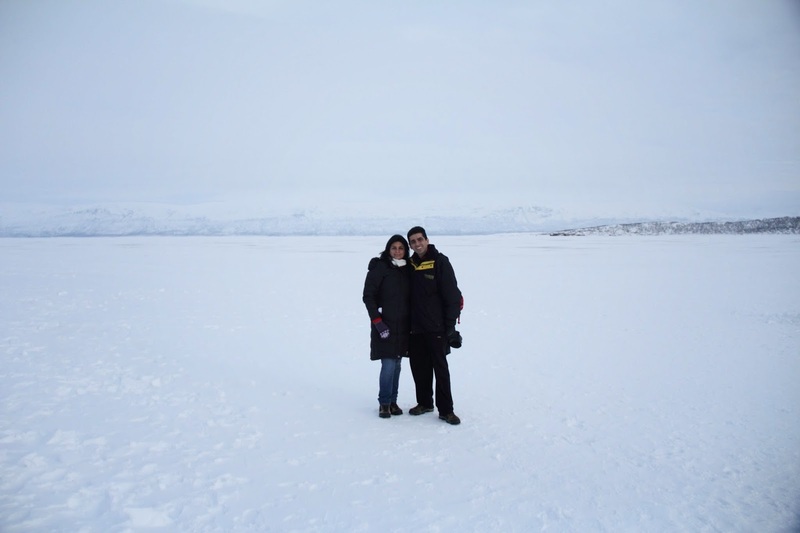 We booked our tickets for a trip in Feb 2013 – Ankur was super excited – so was I. But as departure date approached, I started getting cold feet – literally cold feet. I hate cold weather! Winter in North India, where the temperature is as low as 5 degrees Centigrade, is enough for me to postpone visting family by a month. And here we were, all set to hit the land where average temperature in February was -20 degrees Centigrade! 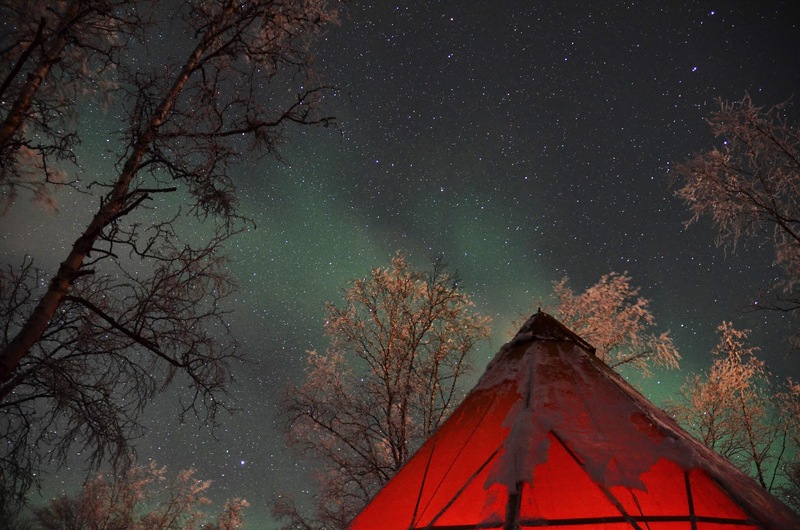 We were off to Abisko in the Swedish Lapland to see the Northern Lights. Why Abisko? It is the driest place in Northern Europe and lies on the Aurora belt. 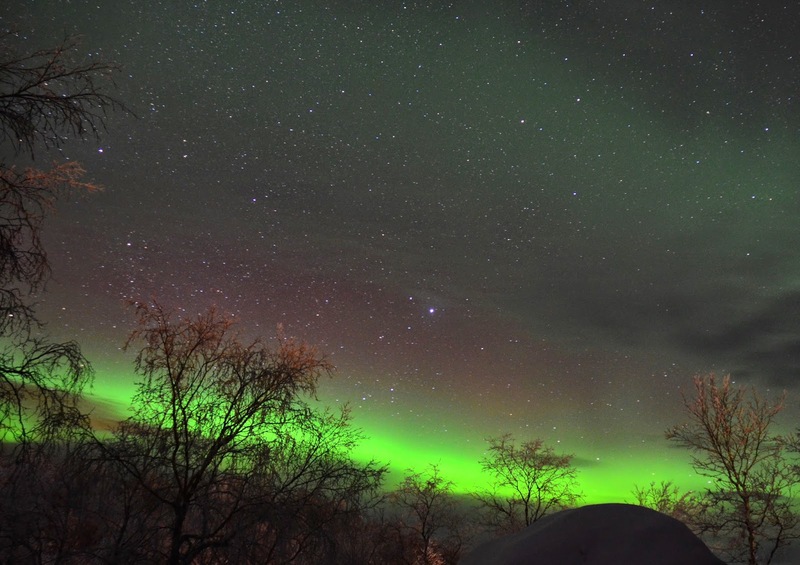 It is said that if you stay in Abisko for four nights in a row during the aurora season, there are high chances that you will see the lights on at least one of the four nights. It made sense to maximize our chances. Secondly, getting to the Swedish Lapland was cheaper that getting to Norwegian Lapland. So, we decided to stay put in Abisko for four nights – a dear proposition as staying in a heated accommodation that is 20 degrees Centigrade above zero, while the outside temperature is bone chilling came at a price! Our base in Abisko was the STF Turiststation hostel at the Abisko National Park. This was our first hostel experience and we loved it. Warm comfortable rooms, clean bathrooms and a full-fledged kitchen to let us vegetarians cook and feed our souls with warm food. Saplings on Earth will need some inspiration from those (if any) on Pluto to grow in the frigid arctic winter. So, don’t expect a plethora of vegetarian food in only restaurant at Abisko National Park. Correction – do not expect any vegetarian food. Besides, how would you stay warm without animal fat? We did stay warm, and ate good food, courtesy moi! The pseudo-chef in me did concoct some decent pasta, fried eggs and sandwiches after doing some grocery shopping at the local supermarket. We also owe a big thanks to all the fellow travelers who shared plenty of grocery as they moved to the next destination. We spent Valentine’s day in the hostel with a lovely lunch, which to our surprise, was vegetarian. Pancakes with delicious jam, lingonberry tea and fresh salad – a delight to be pampered on a special day. One needs a good DSLR camera with a remote and tripod to shoot the lights. And even with all the accessories, unless you are a pro, you will struggle. We had no intentions to struggle in the Ice Age set up and signed up for a photo course with Lights over Lapland. Chad runs the show here – you and your camera will have all his attention. In fact, he will give you the DSLR and tripod during the duration of the course! Our photogroup got together around a crackling fire in Chad’s teepee (traditional Sami tent). It did not seem like the best night to witness the elusive lights. We set up camera and waited patiently. 40 minutes of wait seemed like a couple of hours and I was sure that I would reach India with at only the big toes on my feet (others being lost to frost bite!). After a few minutes , we spotted a faint green glow in the sky, that grew brighter and brighter until it shone bright like a lightsaber from Star Wars. 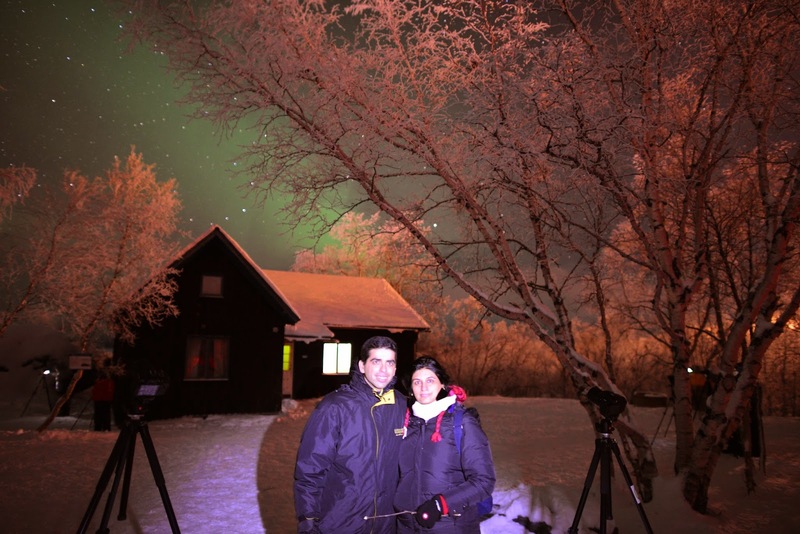 Our first aurora …our first aurora…..Aurora-ed…Awed! Item ticked off the bucket it, but honestly, we were expecting the light fairy to dance and lie parallel to the horizon like the light saber. Where was the action? Too bad..the light fairy didn’t concur with our thoughts that night. We packed our camera equipment and were happy to be back into the snug warmth of the hostel. Ankur was pretty irritated with me- each time I would spot a glimpse of the green light, I would set up the tripod, mount my camera and try being the unsuccessful newbie photographer in the abysmal subzero temperature. After a few unsuccessful attempts, we decided to get on to the ski lift that would take us on top of the hill – the perfect place to watch the lights dance and see their reflection on the frozen lake. We sat on the ice cold (as cold as dry ice) bench of the open air ski lift. It was windy and my eyes watered. I could feel icicles on my eye lashes. I pulled my hoodie to cover my eyebrows and bundled myself together to conserve all the warmth. Ankur was pretty still – I wondered why. I turned my head to the right and I was still too! It was the lights… dancing… slow… and then fast! Bright green ones which had a reddish tinge. The light fairies performed the dance that left us enchanted. I am sure there was some other worldly music playing, which we could not hear…it was a show to watch! The phenomenon lasted for the entire 20 minutes while we were dangling on the ski lift – I was unable to unwrap my camera…and Ankur was glad that I couldn’t – at least I enjoyed the moment in its entirety. As we reached the ski station on the top, a cloud cover hid the lights. We could see the faint blue light and wished for more! I have no pictures to share …just memories that I can relive. 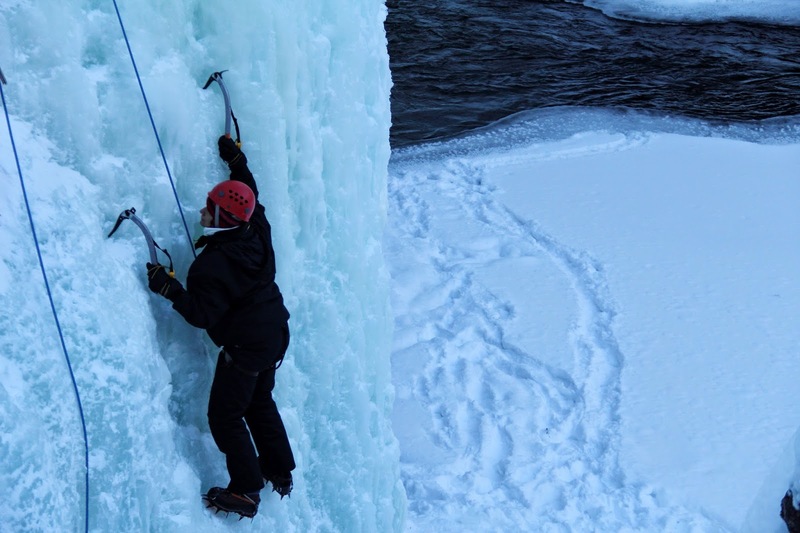 This was about climbing a frozen waterfall. I had signed up for it and paid up for it too. And I did not want to waste the money. I let everyone in the group (7 people) climb before me. My strategy – they will pave the path for me and then, ‘Princess Moi’ will easily clamber over it. Little did I realize that while the path was being paved, my hands and feet were freezing, making the task even tougher.Ankur did a good job and was up pretty soon with some damage (6 inch rip) done to the ski pants. In my defence – so what if I was the last one, and the slowest one – my ski pants were intact when I descended! 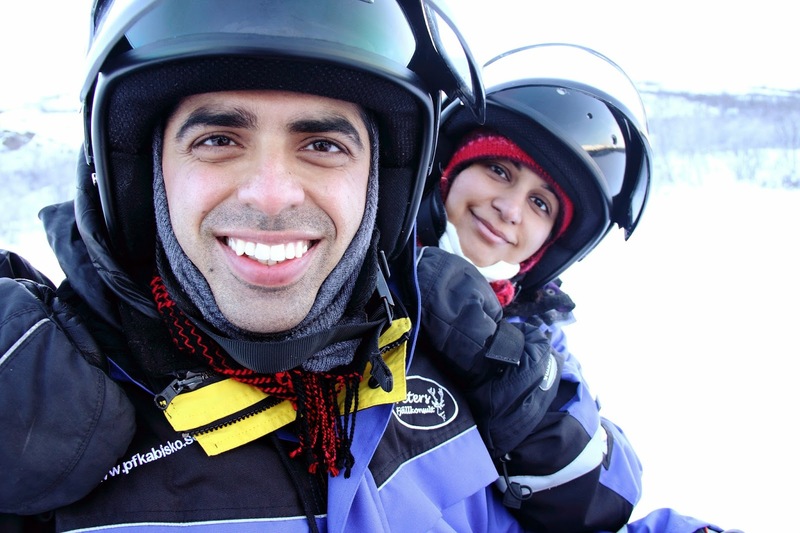 It was Valentine’s day and hence, the perfect day to ride our sled into the pristine white snow of the arctic. We reached the kennel and saw the dogs – blue eyes and upright ears. Boy..were they scary! We were asked to leash our dogs and get them to the sled.I looked at Ankur – he does not like dogs …he definitely does not like aggressive looking dogs! Hold it ….these dogs were not aggressive – they were shy; some of them would run towards the kennel as approached them. Once on the sled, as per a predefined order, all that they wanted to do was to run. 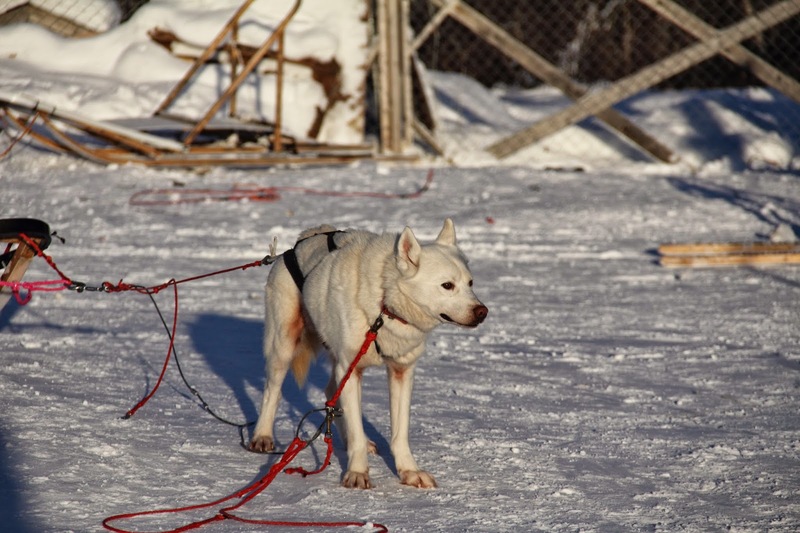 Whether the musher(‘driver’) is there or not, they just wanted to run. 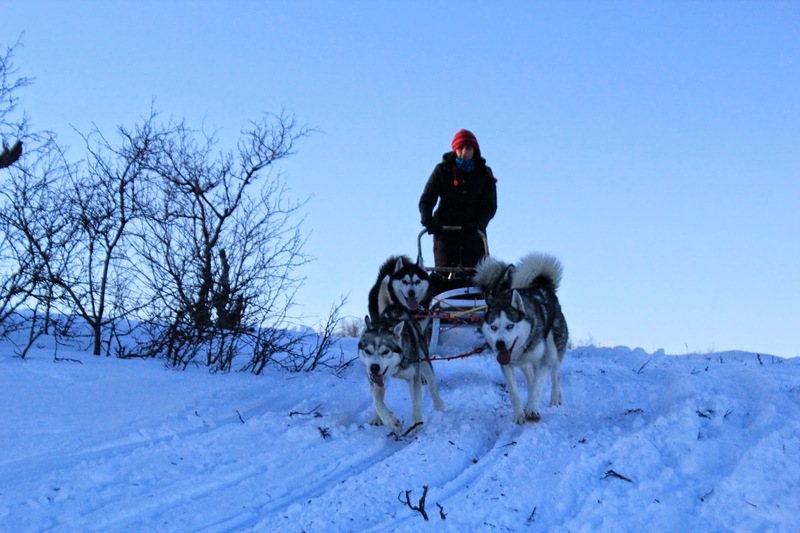 I had four dogs on my sled and it took me lot of effort to weigh them down. Once my foot was off the ground….off zoomed the canines – it was like skiing without using my own muscle power. 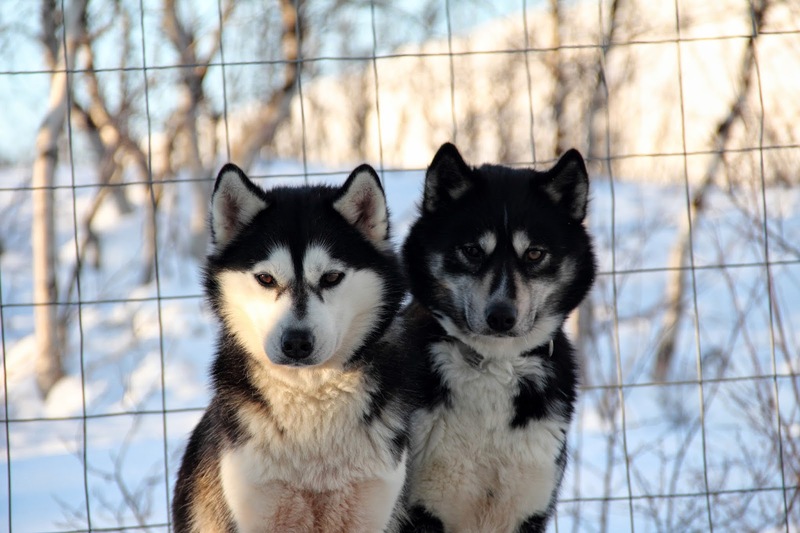 There were occasions when the sled turned and I turned…and toppled ….and rolled in snow…but the dogs went on. It was my job to stay on the sled, and if I could not do it well, it was my problem. Their job was to run and they did it perfectly well! 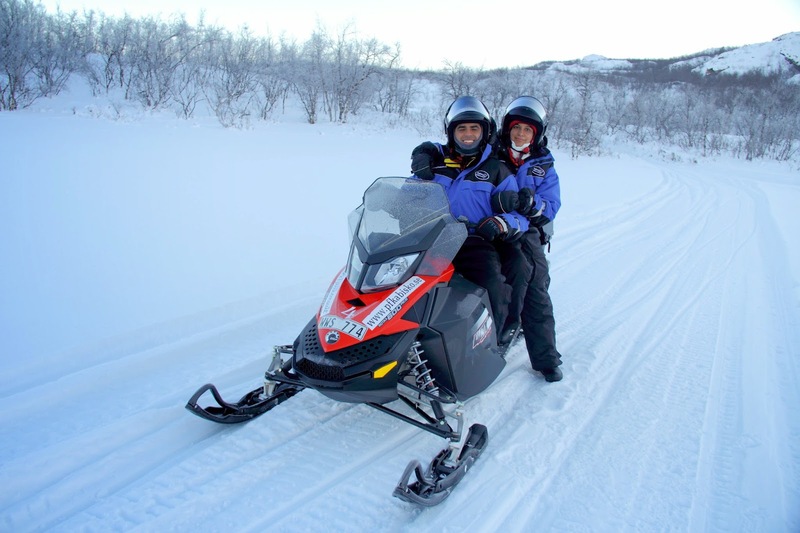 Our final day in Abisko, we decided to take a snow mobile trip into the Abisko National Park. Some part of me believed that we would be able to sight a moose posing. Sadly, the only time I could see a moose was in the zoo in Stockholm. The snow mobile ride was fun, especially gliding over the frozen river. We have never seen such a thick ice cover. Icicles on the branches glistened like tiny diamonds and fresh snow covered the ground like a sheet of cotton. All through the ride, and ever so often, I said my prayers under my breath and out loud as well – hoping that the ice does not give way under the few extra kilos of blubber that I am carrying! I promised that I will try reducing some weight before the next vacation! We braved the cold, played in the snow and saw the lights – a dream come true! 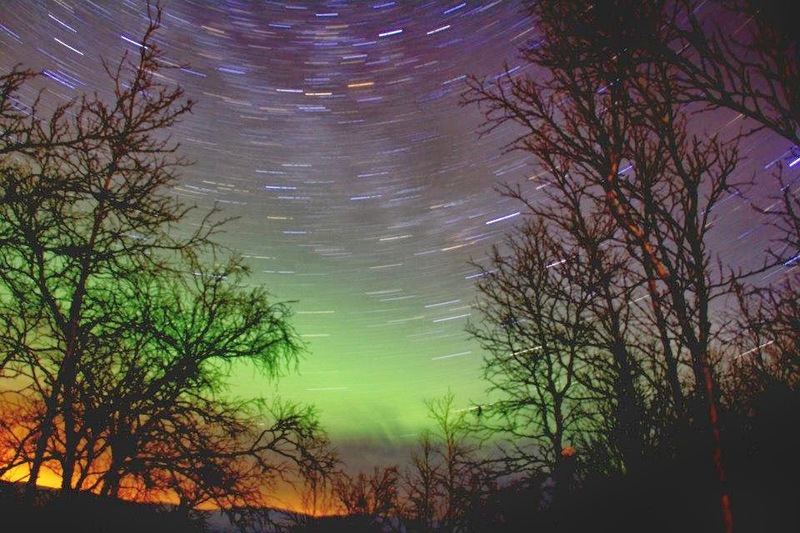 Northern Lights: Why choose Iceland? Excellent article Sonia!! I am so glad you got to experience this. Thanks Saumya! I am glad you enjoyed the article! oh amazing trip! !about how much did it cost?? The trip was an expensive proposition – flight fares from India expensive. We stayed in the STF hostel, which costs USD135 per night for two people – twin hostel room. Food was expensive too – USD 80 for a meal for two without any drinks. Other activities were expensive as well costing approx USD 150 per person per activity – let me know if you need any specifics – glad to help and share contact co-ordiantes! It sure was! 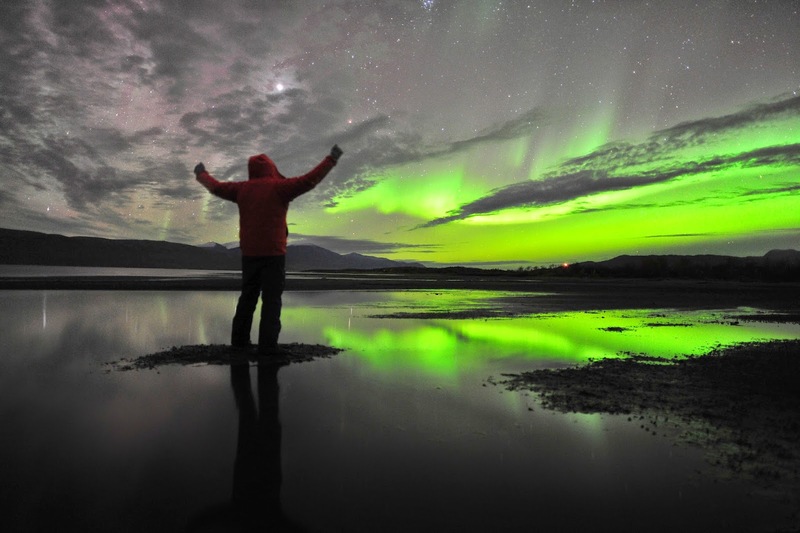 Never been to a place as cold….off to see the lights in Iceland in Feb/march 2015! Thanks Aruna! Glad to help you plan as well!